Figure 1: The ‘Horizon’ tab allows for a STOIIP or GIIP calculation based on geometry defining elements in the upper section of the window. 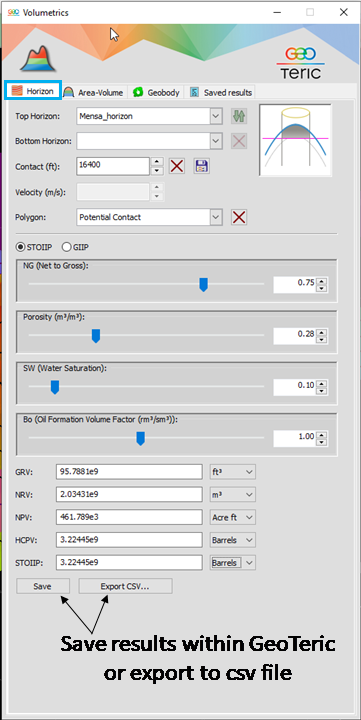 Reservoir and fluid properties for use in the STOIIP equation is entered in the middle section and the results are displayed in the bottom section. These results (gross and net rock volume, net and hydrocarbon pore volume, STOIIP/GIIP) can then be saved in GeoTeric or exported into a .csv file. The Volumetrics user interface can be accessed from the ‘Tools’ dropdown menu or by simply right-clicking on a horizon or geobody in either the 3D window or the data tree. The tool will open to the default STOIIP (stock tank oil initially in place) calculation under the ‘Horizon’ tab shown in Figure 1. In this window, you can define reservoir geometry by selecting top and base horizons, a fluid contact, and a polygon to limit the aerial extent of the volume calculation. Note that if the project is in time, an interval velocity can be supplied to convert the calculated reservoir height from time to depth. The schematic at the top right of the window highlights which structural elements are being used in the calculation. When a depth to fluid contact is used as an input, this is not only shown in the schematic, but also in the 3D scene as a semi-transparent pink plane (Figure 2). This plane will update automatically as the contact depth is adjusted. Figure 2: When a fluid contact depth (or time) is used, a semi-transparent plane will appear in the 3D scene. The plane will update as this contact depth is adjusted so the interpreter can get a quick visual reference for the area above the fluid contact. Once the geometry is defined, you can then input average values for net-to-gross, porosity, water saturation, and formation volume factor. The resulting outputs, which can be reported in units of cubic feet, cubic meter, acre-feet, or barrels, can then be saved in GeoTeric and recalled at any time or output as a .csv file. The second tab, ‘Area-Volume’, calculates depth-area-volume pairs for use in probabilistic volumetrics estimates. In this case, a single top horizon is selected along with upper and lower depths and a depth interval. A polygon can also be used to limit the calculation. The outputs from this, shown in Figure 3, can then be exported and used in a probabilistic modelling software to assess the effect uncertainty in “container” shape has on expected hydrocarbon volumes. 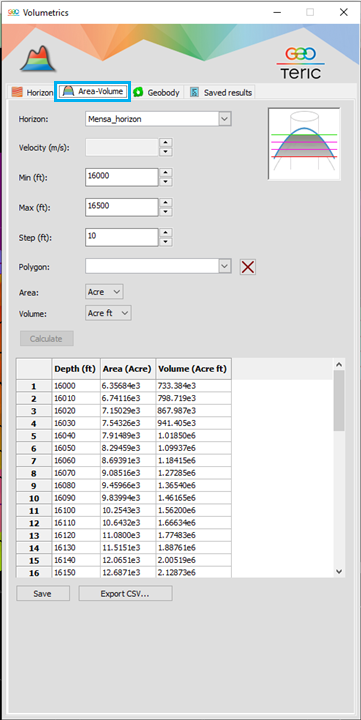 Figure 3: The ‘Area-Volume’ tab allows the interpreter to calculate area and volumes for incremental and regular depth intervals which can then be exported and used as input to probabilistic volumetrics. Note the difference between the geometry schematic in this tab versus the one in the ‘Horizon’ tab. 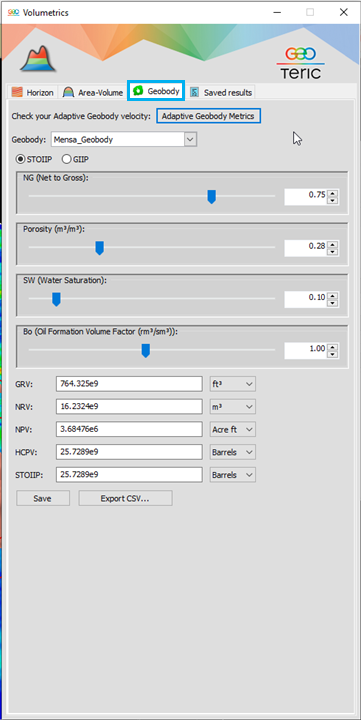 The third and final calculation available in the Volumetrics tool is found in the ‘Geobody’ tab (Figure 4). In this case, the calculation is for STOIIP or GIIP using a geobody rather than bounding surfaces to define reservoir geometry. If the project is in time, you can check and edit the velocity associated with that geobody by using the ‘Adaptive Geobody Metrics’ button. Figure 4: Alternative to using horizons and polygons to define top and base reservoir, a geobody can be used to define the surface bounding the hydrocarbon volume. 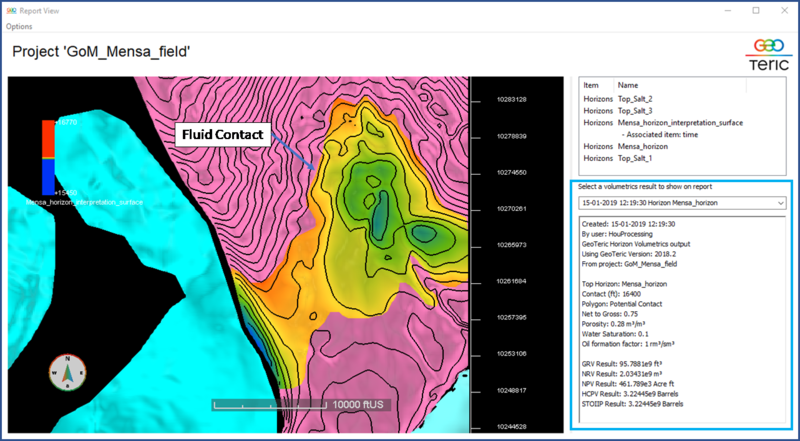 Finally, the ‘Saved Results’ tab can be used to view any previously saved volumetric assessment within the GeoTeric project, including the input parameters to the calculation. Additionally, these results can be used in ‘Report View’ (Figure 5) to promote effective sharing and collaboration. Figure 5: The results of the analysis shown in figures 1 and 2 are posted at the right side of the Report View. 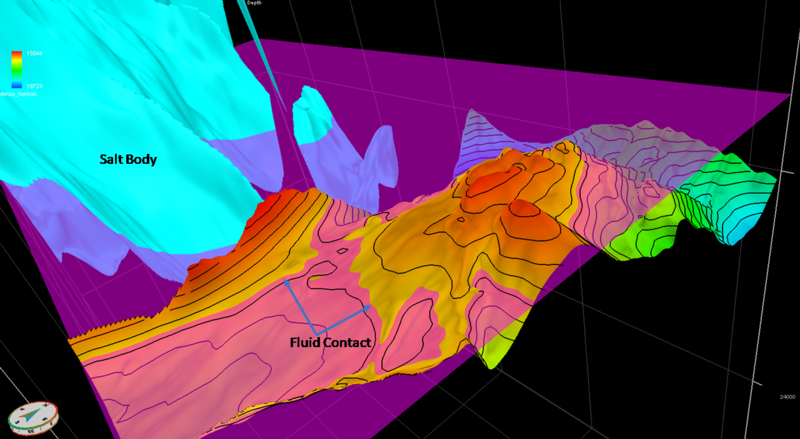 The pink area on the horizon represents the area below the fluid contact. The area above the contact is shown in a spectrum color bar representing depth above contact (or reservoir isochore).